It was also slightly strange at the border as we had to pretend not to know our guide, Holger. This is because we were taking us across as far as La Paz. However, in Bolivia tour guides from other countries are not legally allowed to work there. In fact last month a tour guide was actually arrested taking his group across the border. We had a guide called Rolando, who met us especially just to take us across the border. We hopped off the bus right by the Peruvian side and got stamped out. From there we had to walk across a bridge and into Bolivia. From here it would have been quite difficult on your own as there was no sign posting anywhere as to where to go to get stamped in to the country. We went into a small building and queued into a pantry sized room where an armed guard watched you get your stamp. Some people’s stamps out of Peru were so feint it was a concern that they wouldn’t be accepted, but it was all OK and we hopped back on the bus and headed to La Paz. By this time we were able to say hello to Holger again too… So we now had two guides! Bit odd but that’s the way they do things. We don’t officially change to our officially Bolivian guide until the end of our second day in La Paz, some have both Holger and Roldano until then. I did ask why they didn’t just change at the border in the way we had between Peru and Ecuador and was told that it’s too difficult to administer the budgets otherwise. 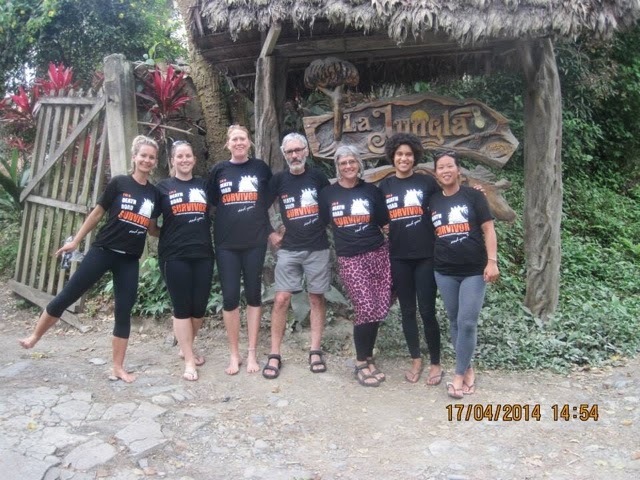 This is due to one leg of the tour finishing in La Paz and nine of the group finishing there. There didn’t feel like there was such a marked change crossing from Peru to Bolivia as there did between Ecuador and Peru. Although Bolivia does appear poorer than Peru at first glance. Bolivia only has a population of 10.2 million people, that’s almost the same as the population of just Lima and almost half the population of São Paolo, its crazy when you think like that! It equates to about one person per square kilometre, although in the altoplato this drops to 0.3 and there are more llamas than people! Also funnily neither La Paz or Sucre are actually the largest city of Bolivia, that is Santa Cruz. Bolivia is a country which has suffered greatly at the hands of others, particularly the Spanish and Chileans. The main industries are mining and agriculture. The country has the second largest amount of natural gas in South America, although exploitation of this resource is highly contentious and the president Evo Morales, the first indigenous president actually nationalised the energy sector back in 2006. President Morales appears to be quite popular at home, as he is very pro indigenous rights. However, he does seem fairly socialist and his relationship with other socialist and communist leaders is something that I think will hold back investment from ‘western’ countries. Bolivia is also one of the highest producers of coca and many rural people are reliant on coca growth for their livelihoods. This is further cause of tension between Morales and the USA as the first has said that coca farming should be supported, but this rather flies in the face of the millions of dollars of US aid which were spent on crop eradication under previous regimes. La Paz is almost the highest capitol in the world at 3600m (second only to Tibet). Although technically it is only the administrative capitol, Sucre is actually the official capitol city. 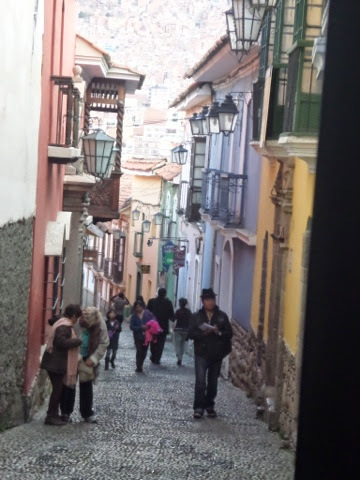 La Paz is the commercial centre of Bolivia and it certainly feels like a big city. The view of the city as we came in was spectacular with thousands of red brick houses along all the thin, highly eroded valleys. In the valley are all the historic and main tall buildings. Apparently the upper areas of the city are mainly home to the indigenous people, the Quechan and Aymaran peoples. We started out with the usual orientation walk around La Paz with Rolando. He took us on a quick spin to a small square and church, which was all lit up. We also bizarrely saw a man in a Santa suit abseiling front down, down the side of the main hotel Hotel Presidente, bizarre! We then headed to the main square where there is the main cathedral and several palatial buildings. 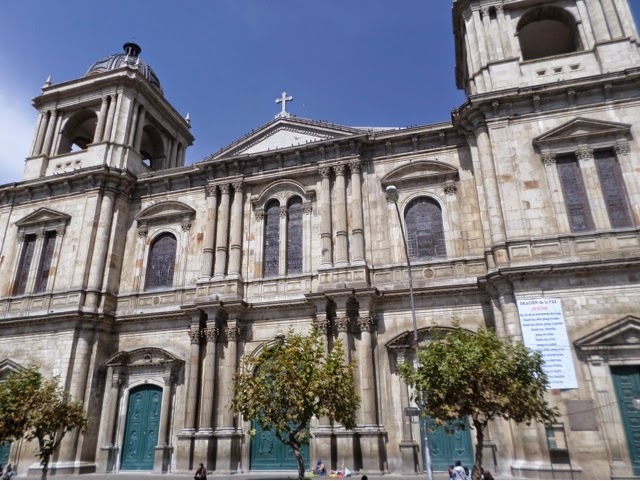 We visited the main cathedral to see the Virgin of La Paz and the Virgin of Copacabana. The city is actually called La nuestra señora de la Paz, I.e. 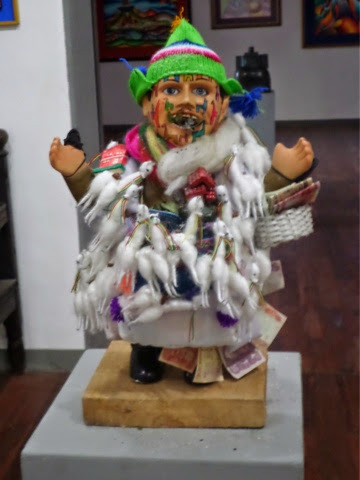 The new lady/or Virgin of La Paz. There are two altars at the side of the church, one for each of the virgins. The first, the Virgin of La Paz is very catholic and western in style. The virgin of Copacabana is a replica of the one actually in Copacabana, which is said to have special powers. The model of the virgin has darker skin and her robes are shaped in a triangle behind her to represent Pacha Mama. Outside in the main square we saw the presidential palace and seat of the congress. The square itself is absolutely full of pigeons, gross! They are everywhere, even on people argh! From the square we headed up the hill to the colonial area of the town. There are a few very nice pretty streets with colourful buildings and balconies. 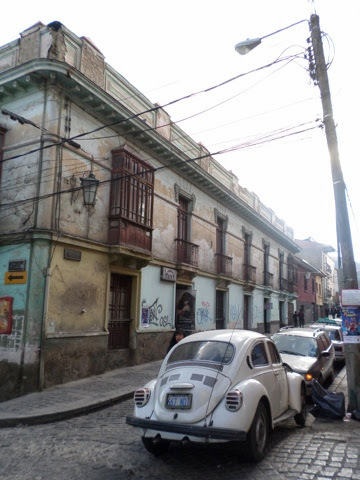 The streets aren’t really as quaint as those we’ve seen in other colonial towns. The surrounding streets were funky but also slightly run down looking. There’s definitely an old world feel to the town, but it also needs a bit of upkeep. We also walked around the witches market, the Mercado de Hechiceria, which is located around our hotel. It was fairly small and felt like a tourist novelty compared to the previous market we visited though. 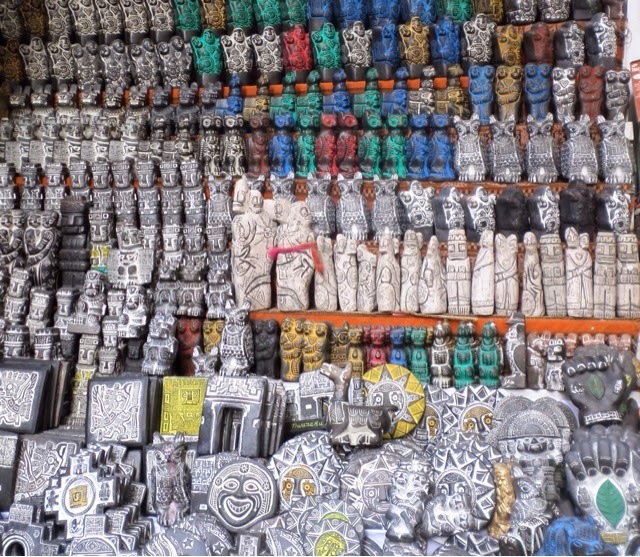 There was the usual llama foetuses and carved tokens you can buy in order to improve certain aspects of your life, as offerings to the gods, for example for wealth, fertility etc. We then got to our hotel and unfortunately I discovered as I was getting into bed that they hadn’t changed the sheets – gross! No one wants to find someone else’s hair in their bed at the best of times! Tokens for health wealth and happiness. 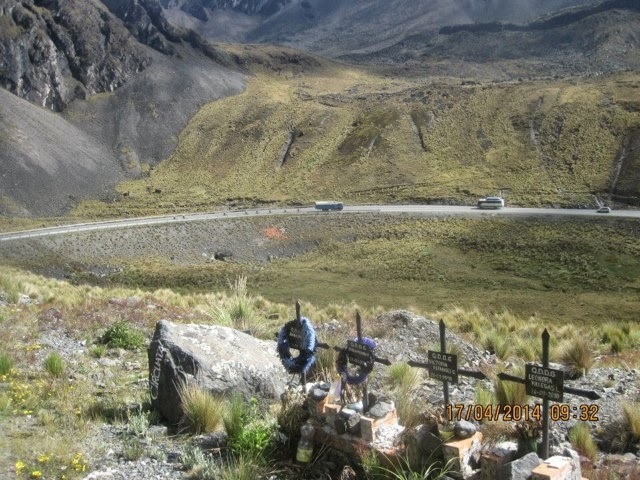 The next day a group of nine of us headed off to mountain bike down the world’s most dangerous road, nicknamed the “Death Road” due to the high number of deaths they used to have on it before it was replaced. The road was original built by prisoners of war from Paraguay during the 1930s. It is now only used by residents along its route and tourists. Whilst I can see how it would incredibly dangerous for vehicles particularly trucks, as it’s only a single lane wide and has enormous sheer drop-offs, it is fine for cycling. I was slightly nervous as I am not an experienced cyclist, but was really excited to do it! 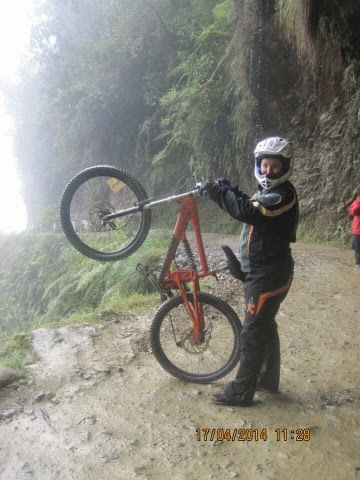 We started up at 4700m at La Lumbre and cycled down past Pongo, Unduavi and Chuspipata through the San Juan waterfalls to the town of Yolosa down at 1200m then ascended back up to 1700m… Pretty good going! We got all our gear on, full motorcycle get up and we looked pretty awesome to be honest. The helmets are quite heavy though, I’m just not used to it. I had a bright orange bike, which was pretty funky. We got given a rundown of signals the leader uses and then headed off down the highway. The road way fairly quiet, although we still had traffic to contend with, including overtaking several large trucks. The first leg was down the new highway which has a nice asphalt surface and the views down the valleys were stunning, we were lucky it was so clear as the weather then set in. It was pretty foggy and you couldn’t see much of anything, the mist was just coming in your visor making it harder to see too. By this time we had all gotten used to the bikes and were flying down the road, it was pretty exhilarating. We then bypassed a tunnel and stopped for breakfast of bread and jam and much needed hot drinks. From there we hopped back onto the bus for a short distance before joining the “Death Road” which is pretty much all off-roading, we were definitely glad for the dual suspension. We headed off and pretty quickly came to a section where an excavator was having to widen the road and we had to wait to be let through. The weather had cleared and in between whizzing downhill and checking out the dozens of small waterfalls cascading at the side of the road, there were awesome views. The scenery here is very green and the vegetation looked a lot more similar to that of Ecuador. We stopped at various points to get photos, which was cool. We did keep getting mixed up with other groups, but you could tell from your jackets who was with who. I stacked it coming through a rough section at the base of a waterfall where there were quite large jagged rocks. I had slowed down too much, so instead of being carried over them I just flopped down sideways, it was pretty hilarious to be honest! The guy behind me was a guide and he pissed himself laughing at me… Luckily he was the only one who saw me though, so I don’t know why I admitted to it here ha ha ha! Further down there were also a few small river crossings and sections where you had to cycle under waterfalls, which was actually quite refreshing. Lower down the hill the gradient levelled out and you actually had to start cycling and with the sun and all the gear you got pretty hot. Unfortunately my bike broke, although this wasn’t such a bad thing as I got given one of the guides bikes, which was far more comfortable on the bum! When we reached the end of the route we all stripped out of our gear and enjoyed a cold drink. We had lunch as a small restaurant up on the hill seemingly in the jungle and ate chicken whilst getting eaten alive ourselves by bugs! The drive back started along a section of the old highway but then joined the new highway. The new road took 23 years to build, although still isn’t actually complete. In places it’s just paved and they are still surfacing it. There have also been some of the most enormous scale landslides I have ever seen anywhere, they are pretty terrifying. We drove across one which had completely taken out the outer barriers. The slip had also stripped out all the support, rock anchors and bolt and tonnes of concrete. An excavator was pushing it all over the side of the road to clear access again. The height of the cuttings and landslides extending to several hundreds of metres above the road and many were completely unsupported. Where they had put on anchors and bolts many were actually broken or damaged. All the drains were also completely blocked and you could see water draining under and around the edges of support as the drains aren’t working. Finally all the surface shotcrete info is completely unsupported and just hangs out over drains, so is just moving downslope in loads of places. It was very interesting from a geotechnical perspective and definitely felt more like the kind of roads I had expected to see in South America. We were all pretty tired by the time we got back but excited for the evening ahead. In the evening we headed off to a football match, the Spanish equivalent of the UEFA Cup. We saw the local team, the Bolivian “The Strongest”, also known as El Tigres play against a team from Uruguay called the “Defensor Sporting”. 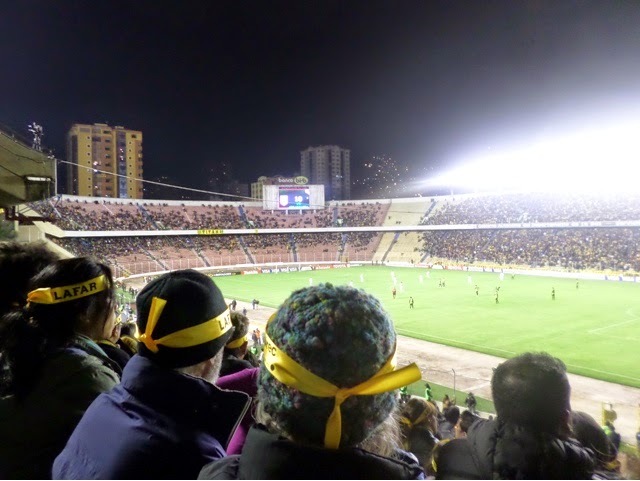 The crowd was fairly packed and we had yellow bandanas to show our support for the local team. The team fan club was pretty raucous and had two bands, it was a great atmosphere and even thought the football wasn’t that great it was a really good fun night. Although we were all a bit surprised that they don’t sell any alcohol at football matches over here. In the end they were victorious and won 2-0; however, the other team did play well given the disadvantage of being at such high altitude. In fact FIFA actually tried to ban matches at high altitude back in 1997, although this may only relate to international matches. The following day was a free day. We had a leaving breakfast at the neighbouring cafe for Tamara. Who was heading back to Australia that morning. The morning was spent with a bit of shopping around the witches market with the girls. I bought a funky cap. The others bought nice leather bags and knick knacks. In the afternoon we headed out to an area called the Moon Valley. It’s essentially a geological park where you can walk around d the highly eroded bedrock. The area was formerly rivers and lakes and the rock is mainly mud, sand and conglomerate bands. You can see awesome weathering across e whole city, but it is particularly prominent in this area, which is to the South of the city in a fairly wealthy area and you can definitely see the difference in the housing. 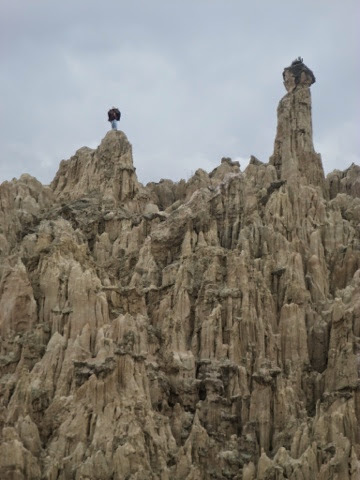 The rock has been highly weathered into pinnacles by the rain and it looks pretty funky. We had a walk around and took a load of photos. There was a “minstrel” who played the ukulele from atop from of the pinnacles as we walked around. There was a slightly odd moment when a man asked for a photograph with all the blonde girls… Each to their own! 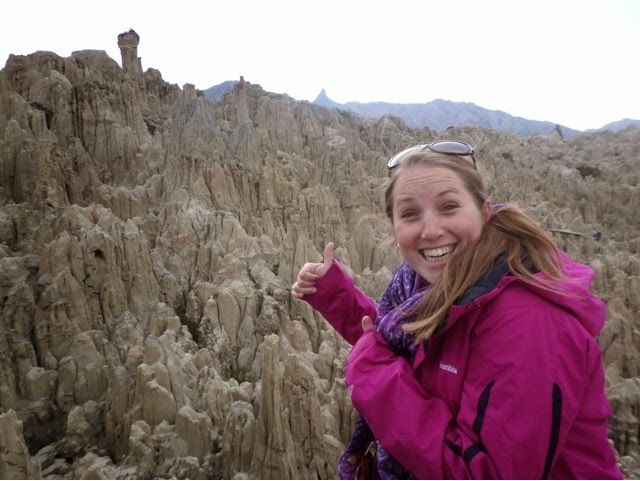 People usually get this excited about rocks right…? Our local maestro serenading us during our tour of the Moon Valley. After heading back to our hotel we said farewell to another member of our group, Aziza. She’s heading off to see the salt flats and then going over to Europe. The rest of our group also finish today, but are staying on in La Paz for a few days on their own before heading off home and elsewhere. That evening we met our new guide and tour group members. Our guide is called Freddie and he is from La Paz. He has only joined Intrepid in the last two years as before he used to work long overland tours. He seems nice, but quieter than our previous guides, he is also a fair bit older. We also have three new tour group members. There is one girl, Lindsay, who is Scottish but has just left her life in Sydney to return to the UK. I’d say she’s in her early thirties and she’s been travelling for a few months already. She has very funky curly hair, the kind I am always jealous of. Bryan is the baby of the bunch at 26 and is from Melbourne, Prahan to be exact. He works for one of the large Aussie banks and as he liked to tell us he’s a “flash-packer” or posh backpacker!!! And is from a “trendy inner city area” so well…. I guess we will see how that pans out. He seems like he will be really good fun though. We headed off for our first dinner together. As it was Good Friday nowhere was really open so we headed to the Hotel Presidente, the only place opens and supposedly the poshest hotel in town. We had thought our dimmer reservation was for the restaurant at the top of the building, which has great views across the city – or so we were told. We arrived and were told to head to the fifth floor… We ambitiously headed up the stairs. The restaurant wasn’t on the fifth floor… We climbed to the seventh floor before giving up and getting in the lift to the restaurant… Which is on the fifteenth floor! We got up there and it was all dark and it turned out to be closed down! So we ended up in the breakfast restaurant which was acting as the main restaurant…. Back down on the first floor! The food was pretty rubbish to be honest, so a bit of a fail all in all. It was nice to get to know the newbies a bit better though. I did get a bit of a weird shock though. I sat down to dinner at the table, next to Bryan. I was overcome by his smell and it was just the most bizarre moment. He wears the same aftershave as a guy I dated last year and it is weird how a scent can transport you back or be so closely connected in your mind with your association with someone. It was just really odd and slightly unsettling, but I think I also freaked Bryan out by knowing what aftershave he was wearing ha ha! The next day was another free day. After a lazy start and breakfast at the nextdoor cafe with Courtney we headed into town. We essentially redid the route of our orientation walk, but slower. 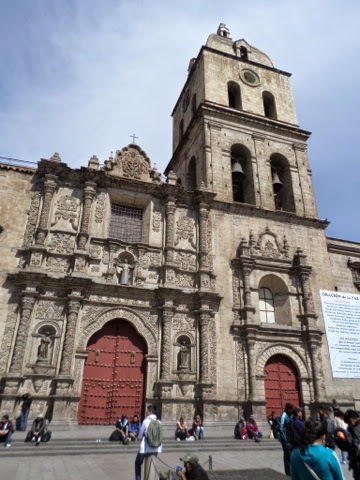 We walked down to the square to the main church and bought small Easter eggs to give to people when we arrive in Sucre on Easter Sunday. From there we headed back to the main square to take some photos of the cathedral and the presidential palace and guards. The church in the main square. The main cathedral, closed to the public as it was Good Friday. 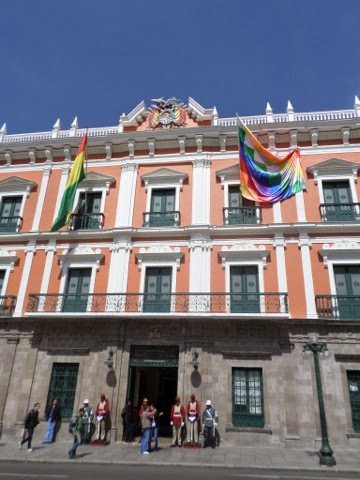 The presidential palace showing the Bolivian and Indigenous flags. 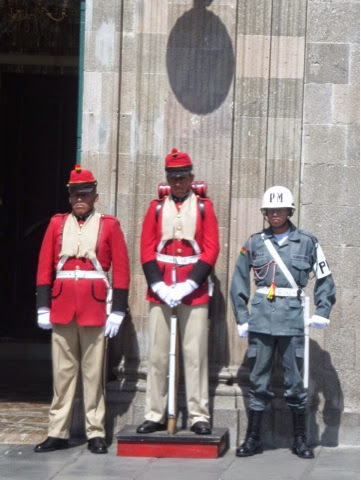 The presidential palace guards, not much competition for the queens guard I reckon. From here we walked up through the colonial streets to visit some small museums. The town has area “faded glamour” feel to it I.e. Everything is pretty dirty and the paintwork is ancient. There are still old VW beetles everywhere, which I love. I don’t know how there are so many still around over here in comparison with other older car models. View of a local street. Colonial cobbled street with nice balconies. After having a look around an art gallery of work by a local artist called Mamani Mamani, who specialises in very colourful animal and landscape scenes, we headed to the local museums. There are four tiny museums all in a row down the main colonial pedestrian street, along with lots of lovely little shops. They show models, precious metal works, military stuff like guns and maps and also local artwork. It was quite funny as there were two very good looking men in the last museum and someone (and not surprisingly this want me) was so distracted by them they went flying head first across the courtyard in dramatic style. 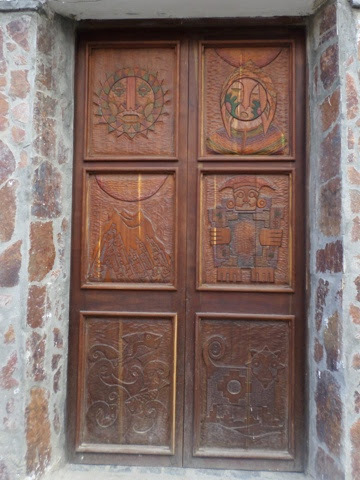 Door of the Mamani Mamani gallery with carvings in the style of the artwork. Models of men like the above are covered with items which the owner wishes for I.e. Money etc. The afternoon was spent in a cafe drinking too much hot chocolate and generally relaxing, gearing up for the night bus journey ahead. We’ve been prepared that it will be bad as it’s a budget bus with no toilet… It’s a ten hour journey so it could be interesting. Michelle was also very brave and had a local haircut! In my mind that’s pretty crazy, but then I know I am a bit too particular about my hair! She looks lovely, it turned out really nicely so yay! 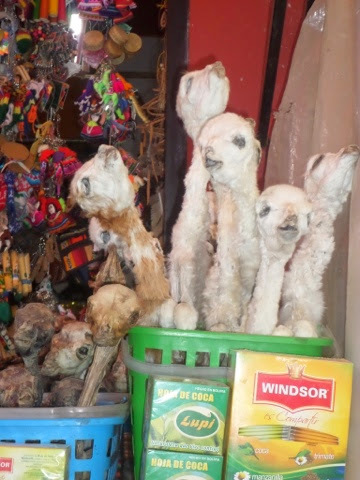 This entry was posted in Travel and tagged Bolivia, Border Crossing, Cathedral, Cycling, Death Road, Desaguardero, Easter, El Tigres, Intrepid, La Paz, Moon Valley, Peru, South America, SouthAmericanAdventure, Travel, Witches Market. Bookmark the permalink.